Urban Matters: You’re one of the leading authorities on retirement in America, so let’s get your opinion of Mayor Bill de Blasio’s recently proposed “retirement security plan” for New Yorkers. But first give us a snapshot of how many New Yorkers are approaching retirement, and how financially prepared they are. Ghilarducci: In 2018, there were just over one million New York City residents between the ages of 50-60 nearing retirement. It is no exaggeration to say that most are woefully unprepared for retirement. This is largely due to the fact that New York City workers suffer from a dire lack of retirement coverage at work. In 2016 (the latest year for which data are available), only 33 percent of workers in the city were participating in an employer-sponsored plan. Not only is that lower than the national average of 37 percent, but the city’s already-dismal coverage rate is going in the wrong direction. It has been falling for the past 20 years. Without access to coverage, it is hard to save. In New York City, half of coupled older households (with at least one worker near retirement age) have liquid assets of less than $60,000. Half of single older workers have less than $5,000 saved. Low coverage rates, combined with the switch from traditional pensions to 401(k)-type accounts with high fees, explain why city workers do not have enough retirement savings. UM: What are the consequences going to be for them and for all the rest of us? Won’t there be a big public expense to having so many retirement-aged people so short of savings? Ghilarducci: You are right. The retirement crisis will affect everyone. Older residents with inadequate savings will suffer the most. They will likely experience a dramatic drop in living standards as they age. This is known as downward mobility, where people enjoy a middle class life while working, but fall into poverty in retirement. 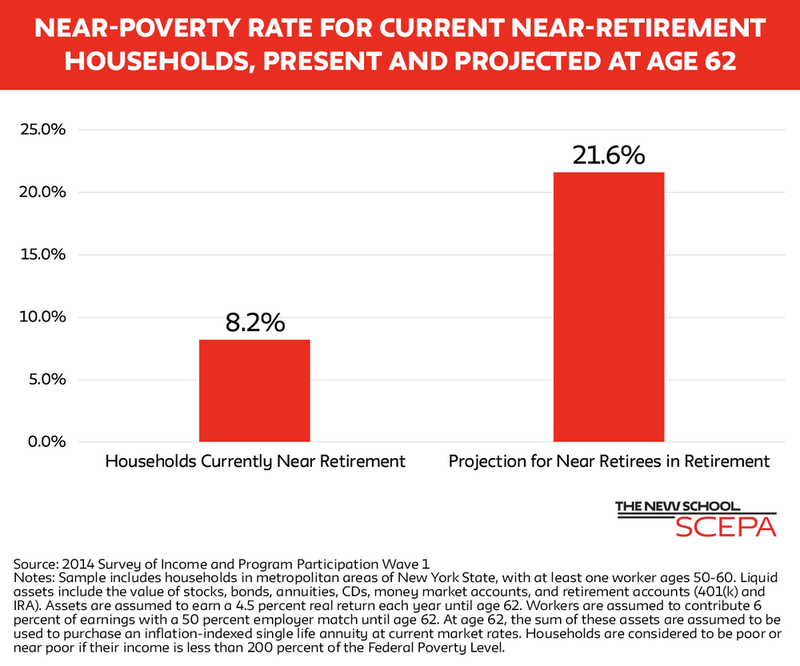 At The New School’s Retirement Equity Lab (ReLab), we estimate that if city workers in near-retirement households retire at age 62, the share in poverty or near-poverty will more than double, from 8.2% while working to 21.6% in retirement. Make no mistake, taxpayers will suffer as well. A growing number of poverty-stricken elderly residents will strain budgets at the local, State, and Federal levels as they access means-tested programs and face emergency needs for housing, food, and health care. UM: The mayor’s plan has been called an “auto-IRA,” or Individual Retirement Account. Private employers with five or more workers who don’t already offer retirement plans, such as 401(k) plans, would be required to enroll workers in a retirement savings plan overseen by the City. There would be a default deduction contribution of at least five percent of worker wages. Workers would be able to leave the system completely whenever they want, or reduce or raise their contribution levels. For a lot of New Yorkers, though, a five percent bite out of every paycheck would be a significant loss – the difference between keeping up with the bills or falling behind on some of them. How do you persuade people to stay in the system? Ghilarducci: I think a voluntary system is a bad system. Many people who need a stable system in which they contribute consistently are those who may drop out. Imagine what the country would have looked like if people could opt out of Social Security when they felt it was inconvenient to contribute. With growing inequality hollowing out the middle class, more and more people struggle to make ends meet. However, research shows low-income workers are not unwilling to save, but have a lack of opportunity primarily due to lack of coverage. In fact, Americans are 15 times more likely to save if they can do so at work, and researchers found that low-income workers’ biggest hurdle to retirement savings is the lack of access to a plan through their employers. The truth is that anything saved is better than nothing. I’ve addressed this very real concern by pairing my retirement proposal for a national system of Guaranteed Retirement Accounts – that calls for contributions from employers as well as employees – with an income tax credit so that low-income savers will, in essence, get their contributions back. UM: Let’s say I’m a small business owner. Will I have to match the workers’ contributions to the system? Are there administrative costs I’d have to pay? Dealing with City and State taxes and required permits and licenses is already a big headache for me. Ghilarducci: The auto-IRA model proposed is highly sensitive to the need to keep administrative costs low for employers. While private sector employers who do not already offer retirement plans will be required to participate, their only administrative burden is to auto-enroll their employees. They do not pay any additional administrative costs, nor do they contribute on behalf of their employees. In fact, this low-cost retirement option is likely to help employers attract and retain workers by providing a much-needed benefit. UM: Five states (California, Illinois, Maryland, Connecticut, and Oregon) have set up auto-IRA plans similar to the one New York City is considering. What’s the track record on them? Are other State and City retirement plans in the works? Ghilarducci: At a time when Federal support for even modest proposals to increase retirement coverage and savings are being rolled back, states are moving forward – fast. Since 2011, 40 states and two cities have either proposed or enacted bipartisan measures to allow private sector workers access to retirement savings accounts. The pace of proposals is a reflection of both the need for reform and the political will to act. Oregon’s plan, OregonSaves, provides an early example of the need and desire for savings, both on behalf of employers and employees. OregonSaves was the first up-and-running plan in the U.S. By the program’s first birthday last summer it had enrolled more than 32,000 private sector employees who previously didn’t have access to a retirement savings plan at work. By the end of 2018, employees enrolled in the program accumulated more than $10 million in savings. Eventually, up to 500,000 Oregon employees will gain access to a retirement plan at work. UM: What’s the road map for turning de Blasio’s proposal into a reality? What kind of legislative approval will it need? When is it likely to come about? Ghilarducci: While I’m not sure of the Administration’s timeframe, it can’t come soon enough for city workers. I believe the next step is for the proposal to be introduced as legislation in the City Council. For years, I’ve heard from City elected officials on the need, so I have no doubt there is a deep well of support for a plan that will allow all workers the opportunity to save to protect and improve their own futures. I would call it a no-brainer. DR. Teresa Ghilarducci is the Bernard L. and Irene Schwartz professor of economics and director of the Schwartz Center for Economic Policy Analysis at The New School (SCEPA). She is also director of The New School’s Retirement Equity Lab.